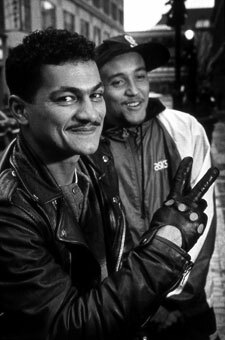 Two young Hispanic men show Jack the peace sign on Pratt Street, downtown Hartford. They’ve just left the boxing gym where they’ve worked out for most of the afternoon before coming downtown to catch a bus back home. At this age, they are filled with brazenness and bravado. Life crackles through their veins, as they claim their manhood. They are fearless and have one another’s backs, should they need it. They know they can count on each other to hang tough if needed on the street.